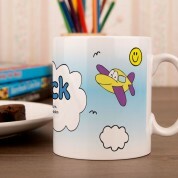 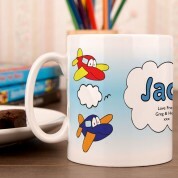 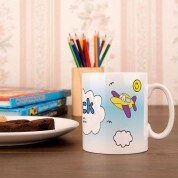 Any little child who loves to watch planes flying over head or travelling on a plane would be delighted with this mug. 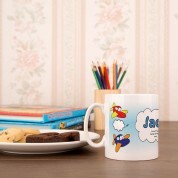 This personalised mug with a colourful design will fit in well in any kitchen or childs bedroom. It can be used to store liquids inside or be kept as a keepsake on a shelf in their bedroom until they are old enough to drink tea or coffee!